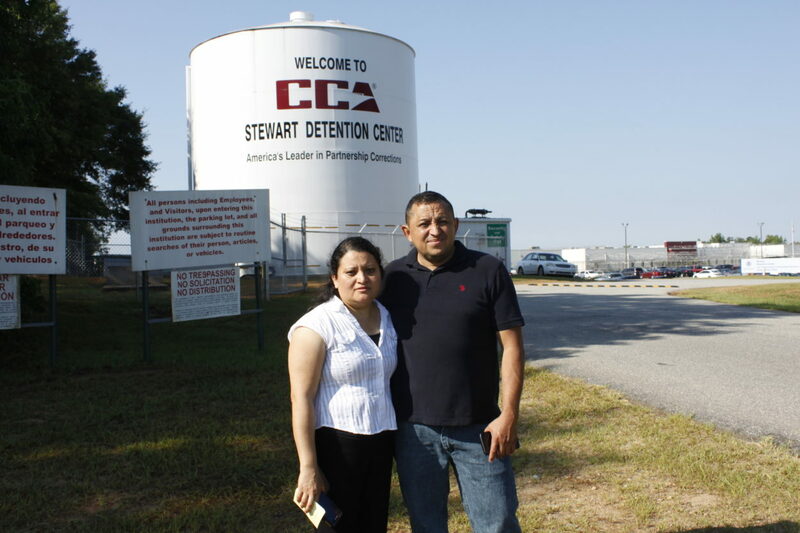 Elsy and Jose Sorto-Hernandez after their son’s bond hearing at Stewart Detention Center in Lumpkin, Georgia. A teenager who has languished in an Immigration and Customs Enforcement (ICE) detention facility for six months is finally free on bond. Yefri Sorto-Hernandez, 19, is one of hundreds of undocumented immigrants arrested last January in a sweep of ICE raids targeting Central Americans who crossed into the U.S. in high numbers in 2014 and 2015. The majority are youth and mothers with young children who fled extreme violence in their homelands. ICE agents arrested Sorto-Hernandez while he was waiting for his school bus in Charlotte, North Carolina, on a winter morning. The same thing happened to dozens more students throughout the country. One third of those arrested in the raids were in North Carolina, Georgia and South Carolina––all of which are under the jurisdiction of ICE’s Atlanta Field Office. “[ICE is] really targeting people like Yefri, who came here at the age of sixteen,” explained José Hernández-Paris, Executive Director of the Latin American Coalition (LAC) in Charlotte. Sorto-Hernandez’s family and more than twenty teachers, students and advocate attended his bond hearing on June 27, 2016. They packed the courtroom at Stewart Detention Center in Lumpkin, Georgia, where Sorto-Hernandez has been incarcerated, along with six other undocumented teens from North Carolina and several from Georgia. The delegation traveled hundreds of miles to the remote facility––operated by a multi-million-dollar private prison corporation––to support the incarcerated youth. “Unfortunately, this high bond amount comes at no surprise given that the Immigration Court in Georgia is one of the most anti-immigrant in the country,” the group’s press release stated. As her husband began calling bondsmen in Atlanta, Ms. Sorto-Hernandez recounted how the couple came to the United States legally when their son was a baby. The were fleeing the aftermath of El Salvador’s civil war, and the journey was dangerous. Believing they would return, they left their child in the care of relatives. As he grew older and their return came to seem less likely, Mr. and Ms. Sorto-Hernandez frequently asked their son to join them. But the avenues for legal immigration had narrowed. She says Sorto-Hernandez was taken into custody when he crossed the U.S.-Mexico border. Upon his release, he reunited with his family in Charlotte and began to build a new life while his case progressed. He enrolled in school, learned English and started planning for college. His parents say his initial legal representation was poor, and eventually an immigration judge ordered Sorto-Hernandez’s deportation. He was arrested four months before his high school graduation. “People are making decisions for their children that are the best, given really difficult circumstances,” said Julie Farkas an English language teacher at Riverside High School in Durham, North Carolina. Farkas was among the supporters at Sorto-Hernandez’s hearing. A delegation from North Carolina traveled hundreds of miles to support Yefri Sorto-Hernandez and other undocumented youth incarcerated at Stewart Detention Center. After the hearing, Farkas visited her student, Wildin Acosta, who is incarcerated at Stewart. ICE agents arrested him in his front yard six months ago. “His family watched him through the window being taken away but they couldn’t do anything about it,” Farkas said. Acosta had joined his parents in the U.S. after escaping gang recruitment in Honduras. According to Farkis, “he was kind of given an ultimatum: join or die.” She said that’s what he will face again if he is deported. That harrowing possibility is underscored by the story of another Charlotte teen currently locked up at Stewart, Pedro Arturo Salmeron. His family members have said that after Salmeron’s cousin was deported back to El Salvador the cousin was murdered and decapitated by gang members. Mayra Arteaga, a supporter from Charlotte, said that Sorto-Hernandez’s victory gives her hope, but it’s overshadowed by the fact so many young people who came to the U.S. seeking safety, like Acosta and Salmeron, are still behind bars. “That’s what’s scary. There are so many who we don’t even know about,” she said. Other shadows loomed over the group. Recently, a Supreme Court tie effectively blocked President Obama’s plan to shield millions of people from deportation. And a bill is moving quickly through the North Carolina legislature that would render useless “community IDs,” which many undocumented people carry in lieu of official identification. HB 100 would also enable the state to revoke funding from municipalities that are deemed to be noncompliant with immigration laws. Compliance would be determined by the State Attorney General, who would be required to respond to any complaint, regardless of its credibility, and empowered to make the ultimate decision on each case. Swatting gnats in the blazing sun outside of Stewart Detention Center, Hernández-Paris addressed these policies with frustration. They rely, he said, on a lack of understanding about the root causes of immigration from Central and South America. “Without understanding that, we don’t understand [this country’s] responsibility. And there is some responsibility,” he said. Indeed, it was the CIA that backed coups to topple democratically elected, left-leaning leaders in countries throughout Central and South America in the 50s, 60s, and 70s. And it was at the School of the Americas, located less than an hour’s drive from Stewart Detention Center, where U.S. soldiers trained military juntas that committed genocide in the civil wars that followed. Those wars necessitated immigration for Mr. and Ms. Sorto-Hernandez’s generation. The rise of cutthroat gangs in the ensuing power vacuum has forced their children to follow. Not to mention U.S. trade policies, like the North American Free Trade Agreement, that have decimated local economies in Central and South America, compelling people to seek employment in the U.S.
“To go through all of that history, it takes like a workshop or something. But the anti-immigrant community uses soundbites, and people believe them,” Hernández-Paris said. "We are defending the security and stability of our families." Carlos Medina blockades the street outside ICE's Atlanta Field Office. Photo courtesy Steve Pavey / Hope in Focus, www.stevepavey.com. At the same time that Sorto-Hernandez’s release was in the works, five people in Atlanta were arrested for blockading the road in front of ICE’s Atlanta Field Office. "We are defending the security and stability of our families, sending a direct message to the Obama Administration,” Carlos Medina, of the Georgia Latino Alliance for Human Rights, said. Medina was among the five arrested for taking direct action. He chained himself to a ladder in the middle of the street, as a crowd chanted and covered the roadway with banners. “We know that [Obama] has the ability to stop deportations at any given time. Our fight will not stop. The only thing that we will stop is the sinister machine that is the deportation machine created by this administration," Medina said. Some elected officials have recently taken up the call against Operation Border Guardian and the detention of undocumented teenagers. Congressional Representatives John Lewis (D-GA), Alma Adams (D-NC), Hank Johnson (D-GA), and G.K. Butterfield (D-NC) co-signed a letter to DHS Secretary Johnson requesting a “humane solution” to the influx of immigrants fleeing violence in Central America. “It is important that, to the best extent possible, our policies reflect compassion for our neighbors fleeing violence and disorder,” they wrote. Three days after Yefri Sorto-Hernandez’s hearing, he was released on bond and reunited with his family once again. A crowd-funding campaign is underway to help the Sorto-Hernandez family with the high cost of his bond.